Using the standard CIA playbook on toppling democratically-elected governments in Latin America, the Obama administration, which was not happy with Ecuadorian President Rafael Correa's moves to increase state control over oil companies in the nation and his decision to oust the United States military from its airbase at Manta, appears to have suffered a major defeat in the failed coup attempt in Ecuador by police officers and Air Force personnel who were backed by rightist elements in the National Assembly and business community. Correa was re-elected with an overwhelming majority last year after he gave the U.S. military its walking papers from the Manta airbase. The Pentagon and CIA have been working to topple Correa ever since by pumping money into opposition political parties and other groups through NGOs funded by the U.S. National Endowment for Democracy. In a statement from Correa after his rescue from the Police Hospital in Quito by a military special operations team, the president warned of a larger conspiracy launched against him by his political opposition, saying the "attempt at destabilization is the result of a strategy that has been brewing for quite some time. A barrage of messages and misinformation have been given to the National Police, which today has been realized through violent actions from a conspiracy attempt." Correa's predecessor, the pro-U.S. Lucio Gutierrez, who is wedded to foreign oil company interests in the country, was accused by the government of covertly supporting the police and Air Force mutineers. Although Secretary of State Hillary Clinton issued a weak statement saying the United States backed Correa, it came one day after Clinton heaped praise on former Secretary of State Henry Kissinger, the person who helped to craft the September 11, 1973 coup in Chile and the assassination of its progressive president Salvador Allende. In fact, Clinton and Obama had given military and political support to the right-wing junta that ousted democratically-elected progressive President Manuel Zelaya in Honduras in June 2009 and has fought against allowing the ousted democratically-elected president of Haiti, Jean-Bertrand Aristide, to return to his country from exile in South Africa after the CIA-engineered coup against him in 2004. Clinton's tepid response to the attempted coup against Correa was in marked contrast to the strong denunciations of the attempted coup and messages of support for Correa that came from Venezuela, Brazil, Argentina, Peru, Mexico, Bolivia, Cuba, and Spain. And the fact that Correa, like Venezuelan President Hugo Chavez, who was briefly ousted in an April 2002 coup organized by the CIA, was held as a virtual hostage at the Police Hospital in Quito for the greater part of a day provided a grim reminder of an old CIA tactic in staging coups in Latin America. Chavez was briefly held hostage on a Venezuelan island in the Caribbean while a U.S.-registered plane stood by to fly him into exile. In an emergency Latin American summit meeting in Argentina, Chavez saw the U.S. behind the events in Ecuador. He said, "The Yankee extreme right is trying right now, through arms and violence, to retake control of the continent." Chavez's own experience with a CIA backed coup and the June 2009 coup, supported by the Pentagon, CIA, and Mossad against his ally Zelaya in Honduras, makes him an expert on CIA and Mossad tactics in the region. Informed sources have told WMR that Correa and Chavez are currently comparing notes on the coups launched against them. Ecuadorian intelligence will be looking closely at the wereabouts of key CIA personnel stationed at the CIA station at the US embassy in Quito and a smaller CIA station within the US Agency for International Development (USAID) mission in Guayaquil. In the 2002 coup attempt against Chavez, the US embassy's top CIA and DIA officers were discovered to be helping to direct the coup from Venezuelan military installations. Clinton's State Department has been casting Ecuador in a bad light throughout the past two years, calling the country "difficult to do business in," the only real priority that the Obama administration cares about due to its total subservience to Wall Street and the fat cat bankers. The State Department's "Investment Climate Statement" for Ecuador states: "Ecuador can be a difficult place in which to do business. . . There are restrictions or limitations on private investment in many sectors that apply equally to domestic and foreign investors . . . A 2006 hydrocarbons law imposed new conditions in the petroleum sector that have been problematic for many companies, complicated by a 2007 decree that imposed additional restrictions. A 2008 mining mandate stalled mining activity, and a new Mining Law is expected in early 2009. Negotiations for a free trade agreement between the United State and Ecuador, which would have included investment provisions, stopped in April 2006. The current Government of Ecuador has not expressed interest in restarting negotiations." Correa's financial policies, as well as his foreign policy that saw him order out the American base at Manta and establish close ties with Venezuela, Iran, and other countries inimical to American and Israeli hegemony, placed a huge CIA and Mossad target on Correa's back. In June, Ecuador sponsored a resolution at the Organization of American State (OAS) summit in Lima condemning Israel's attack on the Turkish aid flotilla transporting humanitarian aid to Gaza. Ten nations voted with Ecuador in support of the resolution. The uprising among Ecuadorian Air Force ranks, with Air Force personnel taking over and shutting down Quito's international airport, will have Ecuadorian counter-intellligence personnel looking closely at the possible role of Israeli technicians and trainers who support the Air Force's 26 Israeli-made Kfir combat planes. Israel also reportedly sold Python-3 air-to-air missiles to the Ecuadorian Air Force in 1997. Mossad also has its hooks into the Ecuadorian National Police, where the main coup plotters received support. Mossad is chiefly tasked with spying on Ecuador's large Ecuadorian-Arab community. The activities of the Mossad station at the Israeli embassy in Quito before and during the coup attempt will also draw the attention of counter-intelligence officers. Last year, Tel Aviv-based On Track Innovations received a contract to provide an electronic biometric-based electronic identification card system to Ecuador's Central Registry Office. The uprising by putschist elements of the Ecuadoran police against President Rafael Correa confirms an alarming report about the infiltration of the Ecuadoran police by U.S. intelligence services released in 2008, which indicated that many members of the police corps developed a “dependency” on the U.S. Embassy. 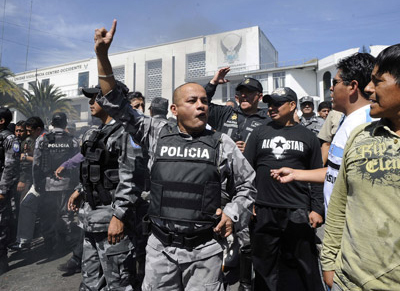 Rebellious elements within Ecuadorian police seize Quito International Airport, 30 September 2010. Guy Philippe, speaking to Peter Hallward about his background prior to leading an armed insurgency that contributed to the removal of Haiti’s elected president, Jean Bertrand Aristide. The systematic use of corruption techniques by the CIA in order to acquire the “goodwill” of police officers was described and denounced on many occasions by the ex-CIA agent Philip Agee who, before leaving the agency’s ranks, was assigned to the U.S. Embassy in Quito. In his official report, distributed at the end of October 2008, the Ecuadoran Defense Minister Javier Ponce revealed how U.S. diplomats dedicated themselves to the corruption of the police as well as officers from the armed forces. In confirmation, the leadership of the Ecuadoran police then announced that it would sanction any of its agents who collaborated with the United States, while the U.S. Embassy claimed “transparency” in its support of Ecuador. “We work with the Ecuadoran government, with the military, with the Police, on objectives that are very important for security,” said the U.S. Ambassador in Quito, Heather Hodges. Valenzuela was accompanied by Todd Stern, “Climate Change Envoy,” also known for his CIA ties.